Including vinyl of their five full-length studio albums–Vegas , Tweekend ,Legion of Boom , Divided By Night , and The Crystal Method, and an unreleased rarities collection–it provides a comprehensive glance at their legacy thus far. They remastered each album and printed on high quality vinyl.Vegas and Tweekend boast their iconic and original out-of-production cover design while the album art for Legion of Boom, Divided By Night, and The Crystal Method are limited editions exclusive to this box set. All five double albums – plus the collection of rarities – totaling 11 discs in all, are packaged in a beautiful, numbered and autographed box. 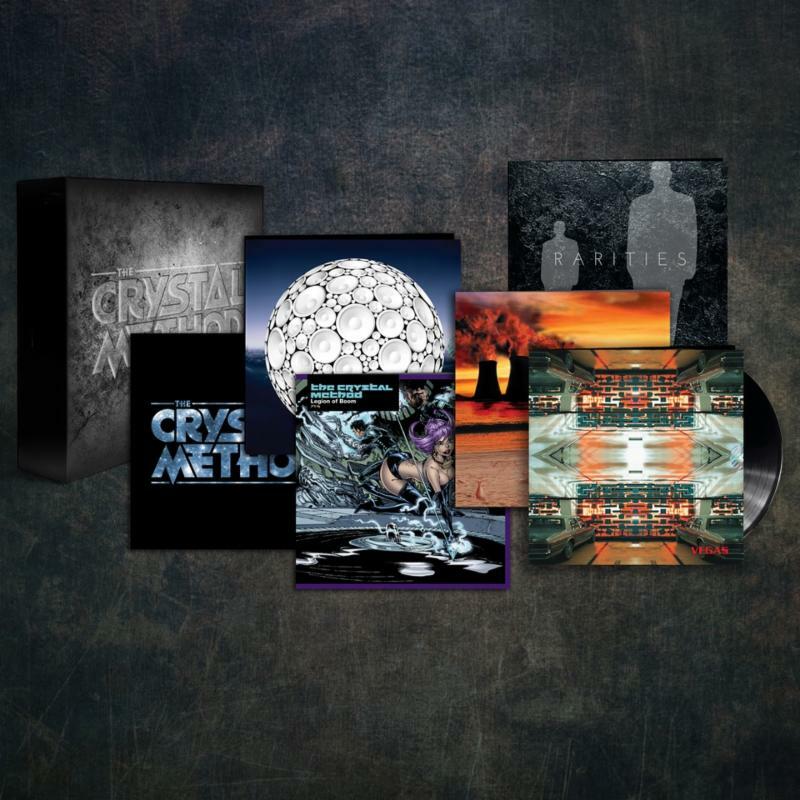 This extremely limited edition package is being produced and released personally byTHE CRYSTAL METHOD. Orders are limited to 1,000. After that, this offer will never be repeated. Scott Kirkland and Ken Jordan independently started making music on their own during the early nineties. However, a chance encounter in the break room of a Las Vegas supermarket where they both worked would set them on their course to becomeTHE CRYSTAL METHOD. Their first singles would be released only on vinyl followed by Vegas, which would become certified platinum by the RIAA. In between releasing albums and never-ending tours, the group’s demand amplified within the film and television worlds. They delivered the smash “(Can’t You) Trip Like I Do” with Filter’s Richard Patrick for the gold-selling Spawn soundtrack, wrote the theme song for “Bones,” scored the indie film London and the J.J. Abrams-produced “Almost Human”for Fox. They also scored characters for The League of Legends video game, and contributed music to everything from Real Steel to Fast & Furious 6, along the way working with Danny Elfman, Tom Morello, LeAnn Rimes, Scott Weiland, Metric’s Emily Haines, LMFAO and even film star Milla Jovovich. Legion of Boom notched a 2004 Grammy Award nomination for “Best Dance/Electronic Album”-during the category’s first year. They also received another Grammy nomination for Divided By Night in 2009, while delivering unforgettable sets on the stages of Electric Daisy Carnival, Coachella, Lollapalooza and HFStival to name a few.